A large portion of my ancestry can be traced back to Poland and Russia. In fact, both of my grandmothers were first generation Americans. That means that in addition to attending American schools, eating American foods, and playing with American friends, they were also raised with strong influences from their parents’ native countries. Their religions, their languages, and their food reflected their family’s heritage, and they in turn passed along many of those same traditions to their own children. The sauerkraut that is a staple on our Thanksgiving, Christmas, and New Year’s tables is the perfect example of a nostalgic recipe that originated with my grandmother, and that will continue to be passed along to my own children as well. In my opinion, these dishes that have so many memories and cultural ties are the most special, most cherished ways to nourish our loved ones. This particular sauerkraut turned out to be one of the most popular sides on my Mom’s Thanksgiving table last month. Kind of shocking, right?! I mean, how could cabbage possibly stand out among the corn puddings, the stuffing, and the ambrosia?! I’m not exaggerating when I say that multiple guests commented on how delicious it was (myself included). I’m not sure if it’s the crispy, smokey bacon throughout or the slight hint of sweetness that cuts through the salty, briny sauerkraut, but I just LOVE this stuff. So imagine my surprise when my mom rattled off the (unbelievably) simple recipe! It tastes complex, but it definitely is NOT. 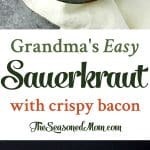 You only need 3 ingredients and 15 minutes to make my Grandma’s Easy Sauerkraut with Crispy Bacon! 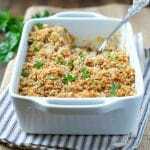 It’s a family favorite side dish that’s perfect for the holidays. 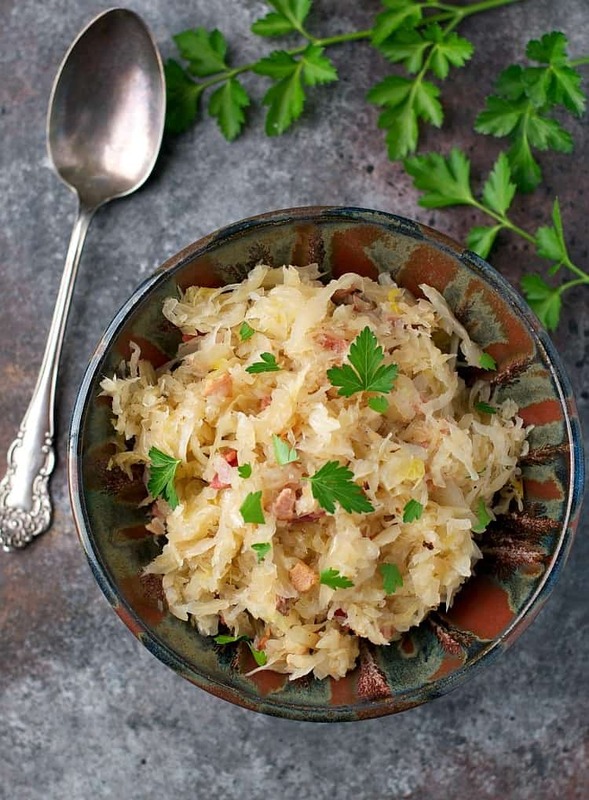 This sauerkraut recipe comes from my dad’s Polish mother. She taught my mom how to make it many, many years ago, and as I said earlier — it has been a staple on our holiday tables for as long as I can remember. 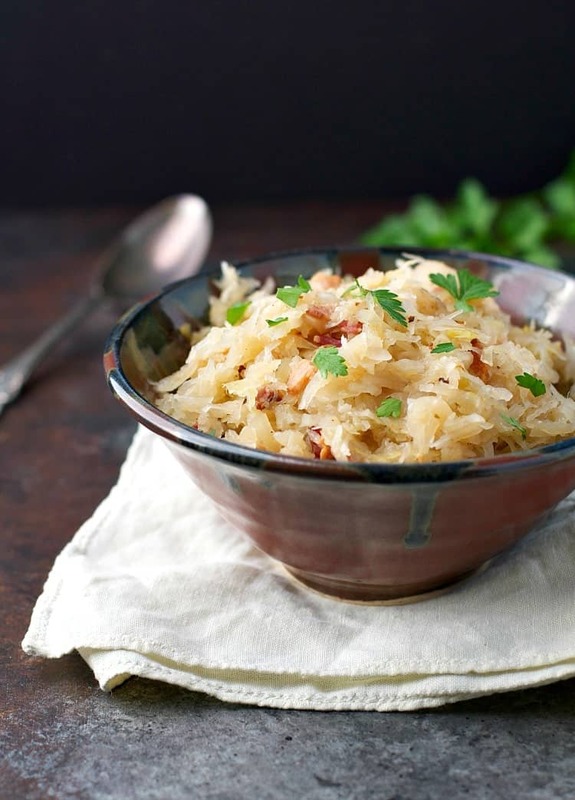 Not only is it incredibly easy and incredibly delicious, but sauerkraut is also believed to be a lucky dish to serve on New Year’s thanks to the green cabbage, which signifies wealth and money. If you’re making your lucky pork, your lucky Hoppin’ John, and your lucky greens in a few weeks, you might as well make this 15 minute lucky cabbage as well! 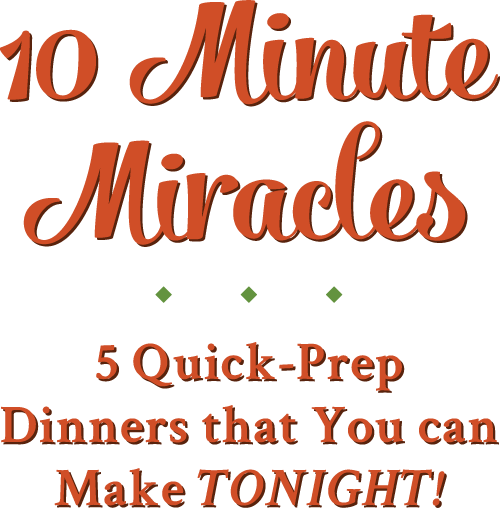 It’s one of my family’s favorite traditions and one that I hope you will enjoy as well! Heat a large pot over medium-high heat. Cook bacon until crispy (about 5-10 minutes). Remove bacon from pot with a slotted spoon and set aside. Drain off most of the bacon grease, leaving about 1 teaspoon in the bottom of the pot. Drain sauerkraut, but reserve the liquid from the can. Place drained sauerkraut, brown sugar, and cooked bacon into the pot. Heat over low heat until warmed through and sugar is dissolved. Add enough of the reserved liquid until it reaches desired consistency. 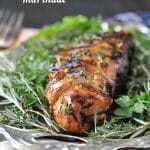 Serve right away, or cover and store in the refrigerator for up to 1 week. I love that you make so many family recipes, Blair! And that’s wonderful that your grandmothers were both first generation Americans. I bet you have so many stories! My Grandma used to make sauerkraut all the time. And although it’s not something I like, I know my husband and dad would love this! Sounds perfect with the bacon! I have such fond memories of this sauerkraut while growing up. My Mom was lithuanian and this was in her family from her Dad who arrived here before the 1920’s. We had it every year for Thanksgiving and also Christmas along with the kugela. Both were stars of the holiday. The only difference we had was that there was no sugar. 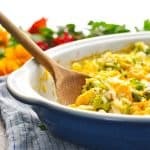 I still make it but I also love sauerkruat with potatoes and sausage – easy one pot meal and very tasty. Thanks so much for taking me back and remembering great holiday memories. 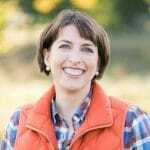 Absolutely love your blog! 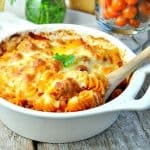 That’s so funny — I love that it’s a recipe that you have nostalgic feelings about, too. My Polish grandmother just passed away last month, so enjoying her sauerkraut at the holidays this year definitely brought back fond memories. Thanks for reading the blog! 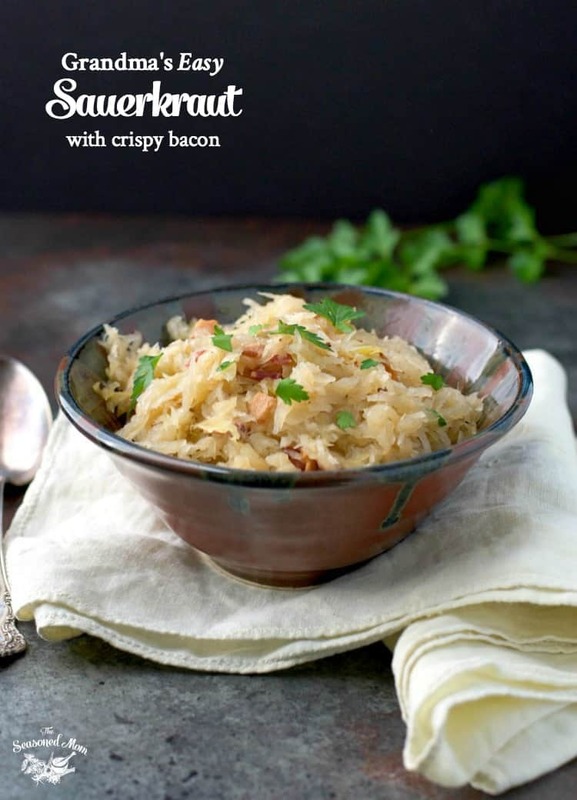 I have never had sauerkraut but this looks so good – and I love the fact that it’s a family recipe too! This is a great way to learn about sauerkraut, Kristy! So easy and so tasty! This dish looks and sounds really tasty, but I think it would extra special if it were made with fresh sauerkraut, not canned. I’m going to give it a try! Thank you so much for your fantastic recipes! Hi, Evlina! Definitely! If you have the time, energy, and know-how to do it with fresh sauerkraut, I’m sure that would be amazing! I just love the shortcut — which is how my great grandmother, grandmother, and mother have always done it. 🙂 Enjoy! That’s just how my mom taught me to fix the sauerkraut but I do add just a bit of diced onion that’s been sauteed in the bacon pan. Love that! The onion sounds like a delicious addition! I GUESS THIS MAY BE A CZECH THING, BUT I MAKE MY DISH WITH THE BACON AND ONION BUT OMIT THE BROWN SUGAR AND AFTER ADDING THE SAUERKRAUT TO THE PAN, I DILUTE SOME OF THE KRAUT LIQUID WITH A LITTLE WATER TO CUT SOME OF THE TARTNESS AND ADD SOME TO THE MIXTURE. AFTER IT IS BUBBLING, I STIR IN A LITTLE ROUE OF FLOUR AND A BIT OF WATER AND IT THICKENS IT NICELY. SOMETIMES I ADD A PINCH OF PEPPER. OF COURSE THAT’S OPTIONAL. 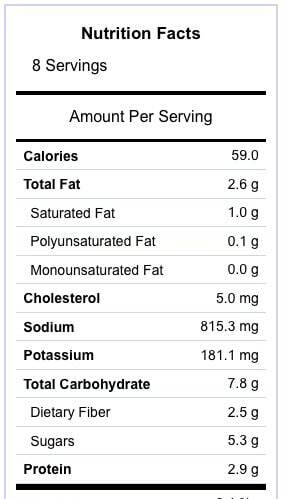 about checking the internet and found your recipe.